Tricia: Hi, Jamie. Welcome! Can you tell us a little about yourself? Jamie: I’m from a small town in northern California. For over three years, I’ve been disassembling and reassembling my life by moving to different countries. I’ve lived in five countries now; America, American Samoa, New Zealand, Scotland and England. Tricia: When you decided to move across the world, what was it about New Zealand that appealed to you? Jamie: In my mid-twenties, I had bad dating experiences in California and a dream to live abroad. I read in a tour book that New Zealand’s population had 100,000 fewer men than women. In the attempt to have some ‘me time’ I moved to New Zealand. Tricia: Were your family and friends supportive of your decision to move so far away? Jamie: I made the decision to go to New Zealand before I told my family. My niece is about to turn ten-years-old, I’m pretty sure she’ll never fully forgive me for moving so far away. Tricia: Do you have a humorous adventure or mishap from your book that you could share with us? Jamie: In New Zealand, I had a lot of culture shock. One of the most memorable moments was learning the meaning of the Kiwi slang word “rooted.” One night I was brushing my teeth with my flatmate and I said, “I’m really excited to live in this house because I have been travelling a lot and I just need to settle down, stop travelling and get rooted.” He was choking on his toothbrush and asked me if I knew what that meant because it had a completely different meaning New Zealand than it does in the States. Tricia: What made you decide to sit down and write a book about your adventures? Jamie: While living in New Zealand, I had funny experiences that I had trouble believing were true. I wrote the stories down to stay sane. I wrote situations down that were happening around me and shared them with friends. Most of the book was written as the events happened; it just took me a few years to work up the nerve to publish. Publishing my book was my way of transforming poison into medicine. I hope that it can help people that have had bad dating experiences or bad work experiences – make them laugh and not give up hope. Tricia: Your book has received excellent reviews. Are you surprised by how well it’s been received by readers? Jamie: I feel very grateful that for the most part readers understand my sense of humor. I’m always surprised and grateful when I receive a positive review. I thought my book would mostly appeal to young women in their 20s or 30s. I was happily surprised by having a couple of men emailing me telling me they loved my book and can’t wait to read the next one. One man told me my book made him laugh and cry. Tricia: What’s next for you? Are there any new books on the horizon? Jamie: I plan to divide my books by the countries I’ve lived in. My next book will be about attempting to settle in Scotland. Tricia: If you could choose anywhere in the world for your next adventure, where would you like to travel and ultimately write about? Jamie: That is the question that keeps me up at night. For unwanted complicated reasons I will have to live in England until summer 2014. It’s a rather strange thing to not know where in the world to live. Every day I want to move somewhere different in 2014. Some days I want to go back to Scotland, America or New Zealand. Other days I want a fresh start in maybe Australia or Wales. I’d love the chance to learn another language by having an adventure is South America or a beautiful European country like Italy. I was very lucky in New Zealand to meet a lot of talented people. I had the opportunity to write and perform for Thomas Sainsbury the most prolific playwright in New Zealand. I performed a monologue about my jobs in the Basement Theatre in Auckland. I would love to work with Thomas Sainsbury again. 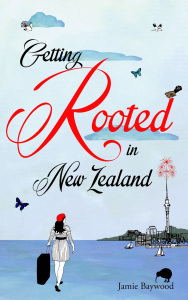 It would be great to return to New Zealand to make Getting Rooted in New Zealand into a TV show with Tom.